Homes for sale in Catonsville are located on the Southwest side of Baltimore County. 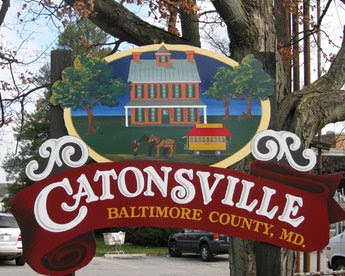 Catonsville was originally a vacation home destination of Baltimore City’s wealthy residents who wanted to escape the heat and humidity. Today, Catonsville is an amalgam of diverse historic buildings, residential charm, commercial & industrial areas, educational institutions, and natural beauty. Catonsville’s main street is comprised of small independent shops and business, many of which are music stores. In fact, because Catonsville has such a high concentration of music stores, venues, and music-related events, the MD legislature, in 2002, issued a proclamation declaring Catonsville to be “Music City, Maryland”. Catonsville’s main neighborhood, Old Catonsville, on the National Historic District since 2002, is comprised of homes with various architectural styles. Homes for sale in Catonsville comprise architectural styles that include Victorian, Queen Anne, Bungalow, Colonial Revival, Dutch Colonial, Tudor Revival, and Craftsman. While nearby Baltimore National Pike, U.S. Route 40, is a shoppers’ paradise with a variety of shops, malls, and big-box retailers to satisfy everyone’s budget. If you are interested in getting your kids outside Catonsville has an active Recreational Council that keeps their youngest residents moving. Offering opportunities to participate in in-house and travel teams for Soccer, Lacrosse, Baseball, Field Hockey, the recreational council fosters sportsmanship, a love of sports and provides some great coaching through parent volunteers. Catonsville’s active Chamber of Commerce does an excellent job of fostering a sense of community among its residents. They sponsor many events and festivals including an Arts and Crafts Festival in September, A Taste of Catonsville in April, Flower Fest in May, a Crab Feast in July, outdoor music concerts, known a Frederick Road Fridays, from June to the end of August on Egges Lane, and the ever popular 4th of July Parade. NOTE: Catonsville residents are passionate about their July 4th traditions and getting a great seat to view the parade is certainly one of them. Approximately one week before the parade, chairs begin to appear on Frederick Road as neighbors stake out the curbs and grassy areas along the parade route. Using tarps, wooden stakes, caution tape, and every chair type imaginable, determined residents choose prime spots and often return to the same area year after year. By July 3rd, thousands of chairs are positioned between the 1000 to 1600 block of Frederick Road, ready for what is probably considered the best parade in Maryland. Catonsville’s access to the Baltimore Beltway, BWI Airport, the MARC Commuter Service, MTA Bus lines, and the Light Rail make it a popular area for those who work in Baltimore City (just 15 minutes from downtown Baltimore) and Washington, D.C. (less than an hour). Ready to check out all that homes for sale in Catonsville has to offer? If so, give me a call at 443-564-0952 or send me an email. I will be happy to create a free, no obligation automated home search for you that will deliver homes meeting your criteria directly to your email. Once you have identified the homes for sale in Catonsville you want to see we can schedule a time go and see them. Check out this classic Catonsville charmer! Almost 2460 sqft of finished Perfection! Full LUXURY Renovation with DESIGNER finishes! 4 Bdrms, 3 Full Baths, Single Family Home, Large Gourmet Kitchen with Granite counters and Island, Stainless appliances, Custom tile. Brand New appliances, HVAC, Compressor, Water Heater. Huge driveway! BIG Open Yard! Beautiful 4BR, 3.5BA home! Updates include refinished hardwood floors, painting, recently replaced gas furnace, gas stove & range hood venting outside. Remodeled master & shared bath. Laminate flooring in basement, beautiful hardwood floors in family room, dining room, stairs, hallway & master bedroom. Fenced backyard with paver patio & cedar picket fence, perfect for relaxing & entertaining. Driveway parking, plus large garage! Open field behind house. Close to elementary school. Charming cottage on .46 acres ~ Special opportunity to expand living space! Fully renovated Kitchen with stainless appliances. Cozy Living Room features wood burning fireplace w/brick surround. Spacious unfinished 2nd floor - plans available for 2nd level bedrooms & private bath. Large lower level includes flush-in and plenty of space for rooms ~ ready for customization! Hardwood floors throughout, replacement windows. Lovely rear porch overlooking extensive landscaped gardens, mature trees, and level backyard ~ perfect for gardening, play or entertaining. Walk or bike Trolley Trail or nearby state park. Visit historic Oella, Ellicott City, Village shops, restaurants & more! Easy access to commuter routes, BWI, MARC Train. There's so much to love about this house! Spacious 4 bedroom cape cod in Catonsville with a fenced in yard! This home features 2 bedrooms upstairs with a full bath and 2 bedrooms on the main level with a full bath. When you enter the front door you are greated with tall ceilings and hardwood floors. There is a large deck off of the back that walks down to the fully fenced in backyard and a lower level deck and fire pit area, a front porch with a swing & large family room in lower level. Near the heart of Catonsville! Walk to Frederick Road, 10 minutes from Patapsco State Park, 15 minutes to Ellicott City, close to UMBC, 695, 95, Baltimore and Fort Meade! RARELY SEEN IN CATONSVILLE!! Quiet cul de sac split level home. Mail level features large living room, dining room and kitchen connected to large Rec Rm for year around entertaining. Upper level: 3BR, 2 BA. master has full BA. Lower level: fourth BR, 1 BA. Laundry room walk out to patio in back yard. Tool shed , attached garage. Great location w/wooded views from front and back! Updated French country kitchen w/oak flooring & upgraded appliances, huge lower level family room w/sliders to yard, Fully repainted with modern colors, brand new carpet throughout, ceiling fans. BRAND NEW HVAC. Wonderful area for leisurely walks w/sidewalks and wooded views. Community pool still has memberships available! Beautifully renovated EOG brick/stone TH with two private parking pads on a one block, one-way street. Sit on the front porch and watch the sunset while chatting with neighbors out walking their dog or doing yardwork. The main and upper levels show sparkling HW floors. You~ll notice charming architectural details like the rounded entry leading from LR to DR. The large DR oversees the kitchen divided by a bar-height counter with breakfast seating on both sides. The kitchen cabinets showcases designer two tone color. The sliding glass door opens to the brand new wood balcony with stairs leading down to the brick patio ideal for warm weather entertaining.The flexible lower level has several options for use. Bring in extra income by renting or provide private space for a loved one. With a separate rear entrance, apartment sized kitchen, a full bathroom, laundry, and soft new carpeting, it currently rents for $875/mo. Or the basement can easily convert back to a large family or play room accessible through the main level kitchen if preferred for full house use. Located in the trendy Paradise neighborhood of Catonsville, two blocks from locally owned restaurants, shops, and Rails to Trails. Close to 695, 95, 70, trains, and BWI. Catonsville offers free outdoor music venues all summer, as well as farmers markets, street festivals, popular 4th of July parade and fireworks, and many other community activities. All systems have been well-maintained and checked by professionals prior to going on the market. The historically preferred slate roof has been preserved in great condition by replacing individual tiles when wear or cracking occurred and should last for decades if properly maintained, although other roof choices are allowed. A freshly paved road and new sidewalks add to the well-kept look of the street. Move in ready! 4 bedrooms, 3 full baths and a half bath with an attached garage; walk out basement with a den, family room and a full bath. This house offers lots of natural sunlight and basement entrance. Very spacious open floor plan, updated kitchen with new appliances. 2 separate laundry areas (main level & basement). Very quiet located off the main road; additional cooktop in the basement and a large deck across the entire back. Home, sweet home!!! This ready to move in townhome is conveniently located in a great hot spot close to UMBC, with a shopping center and major highways just around the corner. This 3 level house features many renovations, including but not limit to: sleek and shiny oak wood flooring are installed throughout the house, a new roof in 2016, new HAVC in 2018, and new water heater in 2018. Newly remodeled kitchen (in April 2019 ) comes with a granite countertop and all new cabinets. Not to mention it~s freshly painted from wall to wall throughout. With your tour, you will be impressed by this gorgeous home, especially with this supersized living room on the main level and spectacular entertainment/family room in the basement. The master bedroom comes with its own full bath in upper level. Enjoy the sights of the community straight from the comfort of your deck. Fully finished basement comes with a complete walkout to the backyard. Hurry, come to appreciate this stunning home, it won~t last long on the market! Don't miss this beautiful 4 bedroom, 3 full bath stone rancher on a landscaped 1/2 acre + lot in scenic Westerlee. Covered front porch and covered rear patio. 1st floor sunken living room with stone woodburning fireplace off the eat-in kitchen. Oak hardwood flooring throughout. Formal dining room. Fully finished lower level with 4th bedroom, 2 clubrooms-one with a 2nd fireplace. 2 car garage with auto opener. Other features - New water heater, recent HVAC, security system and invisible dog fence. See it today! Welcome home. Fantastic opportunity to purchase your new home in the sought after Academy Heights. One of the largest homes in the community with 1800 sq ft of living space. New indoor HVAC unit installed Jan 2018, outdoor unit installed 2014. Granite counter tops, tile backsplash, breakfast bar, hardwoods throughout, crown molding, 6 grid vinyl replacement windows. Full bathroom in basement level. Enjoy quiet time on the covered, raised rear deck. Property is located towards the rear of the community within sight of Mount de Sales Academy on the hill. A well-maintained, beautiful Brick townhouse with covered front porch. The main level includes Living Room, Dining Room, and Kitchen. Upper level has 3 BRs and Full Bath. Finished lower level with a large family room, half bath, and a utility room. Walkup to the spacious rear yard/Parking space for 2 cars. Hardwood floors on the main and upper level. Recently painted throughout. Easy access to all major highways, MARC station, walkable distance to Catonsville local restaurants and stores, close to UMBC and CCBC and Short walk to a beautiful trail. One year home warranty is included.